On June 27, 2012 McCarran International opened a third terminal for both international and domestic flights. This $2.4 billion expansion is the largest public works project in the history of Nevada. The expansion adds 14 gates to McCarran International, including 6 gates for international flights. It will be a self contained terminal with its own central plant facilities, roadways, eight-story parking garage, ticket counters baggage claim and 83,000 ft concession area. The terminal will have an automated tram to connect it to the rest of the airport. It also includes the latest technology in self-boarding gates and hi-tech aircraft docking systems that free up ground support staff for other tasks as well as 1,000 LED and LCD displays for up to the second airport data. This expansion raises McCarran's passenger capacity to 55 million per year, making it the 23rd most trafficked airport in the world. Now over 1,000 flights will come through Las Vegas every day, from over 100 different cities. 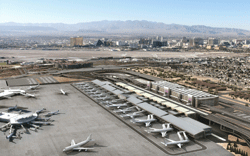 The project was also a significant job creator in Las Vegas, as over 2,000 workers came to the city to assist with constructing the new terminal. Nevada Senator Harry Reid is confident the terminal will "boost Southern Nevada's local economy, create jobs and expand Nevada's middle class." 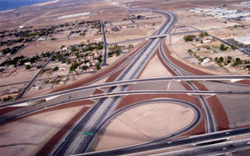 Las Vegas has undertaken a joint venture with other municipalities to improve transportation infrastructure, the centerpiece of which is the Bruce Woodbury Beltway, a 50 mile highway circling the centre of Las Vegas. Its initial construction was completed in 2003 and it is planned to be incrementally improved until it is a full freeway in 2025. The highway circles three quarters of metropolitan Las Vegas, providing swift transportation to thousands of commuters every single day. It has gained national and local recognition as an example of an innovative, effective and proactive solution to the demands of explosive population growth. This project is estimated to cost $1.7 billion and is completely planned and constructed by Clark County Public Works. It marks the first time in US history that a county has overseen construction of a major highway with little to no state or federal funding. This remarkable investment displays the utmost confidence Nevadans have that Las Vegas is destined for unparalleled growth in the near future. On August 14, 2012 the Southern Nevada VA Medical Center opened, providing immediate healthcare to veterans from all over the southwest. The billion dollar project begun in 2003, after the previous hospital, the Guy Ambulatory Care Centre closed due to construction defects. This 1 million square foot centre sits on a 151 acre property donated by the Bureau of Land Management. It includes an attached mental health facility, as well as an eye clinic, centre for infectious disease and pharmacy. The facility is anticipated to serve 60,000 veterans out of the 400,000 that live in Nevada. The hospital is staffed by over 1,800 health care professionals and will continue to bring more jobs and people to Las Vegas. Downtown Las Vegas has recently been an afterthought to the world famous Strip in the minds of tourists and businesses. However, two major revitalization projects have been undertaken to breathe life back into the downtown core. The Las Vegas Redevelopment Agency, along with numerous property and business owners, invested $5.5 million into Fremont East, a massive pedestrian-only neighborhood highlighted by a 90ft high illuminated canopy lined by casinos and restaurants. This entertainment district opened in 2007 and has drawn tourists back to the Downtown area as a prime destination for gaming and nightlife. The Smith Center for the Performing Arts in Symphony Park opened in May of 2012, providing Las Vegas with its first performing arts center. The unprecedented $470 million Center includes three theatres, one of which has a capacity of over 2,000, and a 2 acre lawn for outdoor performances. The Smith Center's first productions were The Color Purple and Mary Poppins. The Center will continue to run such classics as Les Miserable, West Side Story, Wizard of Oz, Mamma Mia!, and many more.